This problem is faced by one of my friend also and then he contacted the Geek Squad and they provide him with a proper solution. Geek Squad Protection avail you with protective measure and repair standards that ensure the integrity of the product and unharmed performance of the device. To know more about Geek Squad Protection contact us. Geek Squad Tech Support is an efficient and instant repair service providing team accessible from across the globe. These experts can be relied upon to avail the best of repair services, call them at Geek Squad Phone Number . If your bluetooth headset is not working properly, then you can try to make headset as you default device and check if it works. Click Start, type Sound in the Start Search box. Click Sound in the search results at the top of the Start menu. Click the Playback tab. Notice the check mark next to the default device. For most users, the default device is head set. On the Playback tab, select the playback device, click Properties, click the Advanced tab, and make sure that the Default Format is set to the value that you expect. When you finish, close this window to return to the previous window. On the Playback tab, select the playback device, click Configure, and then make sure the configurations are set correctly. Though you have updated the head drivers, I would suggest you to uninstall and reinstall the drivers from the manufacturer’s website. Type devmgmt.msc in the start search box and press enter. Right click on the head set driver and select uninstall. Download and install the drivers from the manufacturer’s website. Go to your Bluetooth icon left click it menu will open. Go up click Show Bluetooth devices left click it now your in the Control Panel\Hardware and Sound\Devices and Printers. Place your device in pairing mode and hit Add a device when you see your device click on it to add it and the drivers. 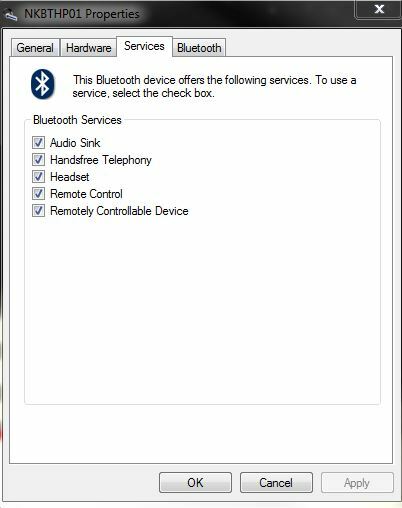 After your drivers have installed, go Back to Control Panel\Hardware and Sound\Devices and Printers and right click on your bluetooth headset. Go down to properties left click. Now your in the headphone properties go over to Services left click it. After highlighting or checking these boxes click Apply and more drivers will install after drivers finish. On some headphones there might be more options, so check for them as well. I hope this helps in getting the sound in your bluetooth headphones. If it doesn't I will suggest you to contact iBall service center to check if it is a hardware issue.